The violin is a bowed string instrument with four strings tuned in perfect fifths. It is the smallest and highest-pitched member of the violin family of string instruments, which also includes the viola, cello and double bass. 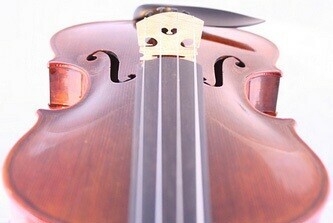 A violin is sometimes informally called a fiddle, no matter what kind of music is played on it. The word "violin" comes to us through the Romance languages from the Middle Latin word vitula, meaning "stringed instrument" this word may also be the source of the Germanic "fiddle". Turkic and Mongolian horsemen from Inner Asia were probably the world’s earliest fiddlers. Their two-stringed upright fiddles are strung with horsehair strings, played with horsehair bows, and often feature a carved horse’s head at the end of the neck.... The violins, violas, and cellos we play today, and whose bows are still strung with horsehair, are a legacy of the nomads.. It is believed that these instruments spread to China, India, and the Middle East (rebab). The violin in its present form emerged in early 16th century in Northern Italy, where the port towns of Venice and Genoa maintained extensive ties through the trade routes of the Mongol Empire. Most likely the first makers of violins borrowed from three types of current instruments: the rebec, in use since the 10th century (itself derived from the Arabic rebab), the Renaissance fiddle, and the lira da braccio. One of the earliest explicit descriptions of the instrument, including its tuning, was in the Epitome musical by Jambe de Fer, published in Lyon in 1556. By this time, the violin had already begun to spread throughout Europe. The oldest documented violin to have four strings, like the modern violin, was constructed in 1555 by Andrea Amati. Other violins, documented significantly earlier, only had three strings. The violin immediately became very popular, both among street musicians and the nobility, illustrated by the fact that Catherine of Medici ordered an entire orchestra of 38 instruments from Amati for her son the French king Charles IX in 1560. There were 24 violins and the oldest surviving violin, dated inside, is from this set, and is known as the "Charles IX," made in Cremona c. 1560. "The Messiah" or "Le Messie" (also known as the "Salabue") made by Antonio Stradivari in 1716 remains pristine, never having been used. It is now located in the Ashmolean Museum of Oxford. A violin typically consists of a spruce top (the soundboard, also known as the top plate, table, or belly), maple ribs and back, two endblocks, a neck, a bridge, a soundpost, four strings, and various fittings, optionally including a chinrest, which may attach directly over, or to the left of, the tailpiece. A distinctive feature of a violin body is its "hourglass" shape and the arching of its top and back. The hourglass shape comprises two upper bouts, two lower bouts, and two concave C-bouts at the "waist," providing clearance for the bow. The "voice" of a violin depends on its shape, the wood it is made from, the graduation (the thickness profile) of both the top and back, and the varnish which coats its outside surface. The varnish and especially the wood continue to improve with age, making the fixed supply of old violins much sought-after. All parts of the instrument which are glued together are done so using animal hide glue, a traditional strong water-based adhesive that is reversible, so that the glued joints can be disassembled if needed. Weaker, diluted glue is usually used to fasten the top to the ribs, and the nut to the fingerboard, since these parts commonly need repairs. The purfling running around the edge of the spruce top provides aims to prevent cracks at the edge extending any furthera. It also allows the top to flex more independently of the rib structure. Painted-on faux purfling on the top is a sign of an inferior instrument. The back and ribs are typically made of maple, most often with a matching striped figure, referred to as "flame," "fiddleback" or "tiger stripe" (technically called curly maple). The neck is usually maple with a flamed figure compatible with that of the ribs and back. It carries the fingerboard, typically made of ebony, but often some other wood stained or painted black. Ebony is the preferred material because of its hardness, beauty, and superior resistance to wear. Fingerboards are carved with a particular transverse curve, and have a small lengthwise "scoop," or concavity, slightly more pronounced on the lower strings, especially when meant for gut or synthetic strings. When considering an instrument the most valuable and important parts are the body and the scroll. The body is what creates the sound. Over time it is acceptable for the neck and fingerboard to be replace. Other parts such as the bridge and sound post can be changed to improve their contribution to sound. Parts such as the pegs, chin rest and tail piece can also be changed easily if needed. The Sound post seen through f-hole The bridge is a precisely cut piece of maple that forms the lower anchor point of the vibrating length of the strings and transmits the vibration of the strings to the body of the instrument. Its top curve holds the strings at the proper height from the fingerboard in an arc, allowing each to be sounded separately by the bow. The sound post, or "soul post," fits precisely inside the instrument between the back and top, below the treble foot of the bridge, which it helps support. It also transmits vibrations between the top and the back of the instrument. Strings were first made of sheep gut (commonly known as catgut), stretched, dried and twisted. Modern strings may be gut, solid steel, stranded steel, or various synthetic materials, wound with various metals. Most E strings are unwound, either plain or gold-plated steel. Violinists often carry replacement strings with their instruments to have one available in case a string breaks. Strings have a limited lifetime; apart from obvious things, such as the winding of a string coming undone from wear, a player will generally change a string when it no longer plays "true," with a negative effect on intonation, or when it loses the desired tone. The longevity of a string depends on how much and how intensely one plays. The E string, being the thinnest, tends to break or lose the desired tone more quickly than the others. The range of the violin extends from the G below the middle C to the highest note of the modern piano. The top notes, however, are often produced by natural or artificial harmonics. Children typically use smaller string instruments than adults. Violins are made in so-called "fractional" sizes for young students: Apart from full-size (4/4) violins, 3/4, 1/2, 1/4, 1/8, 1/10, 1/16, and even 1/32-sized instruments exist. Extremely small sizes were developed along with the Suzuki program for violin students as young as 3 years old. Finely-made fractional sized violins, especially smaller than 1/2 size, are extremely rare or nonexistent. Such small instruments are typically intended for beginners needing a rugged violin, and whose rudimentary technique does not justify the expense of a more carefully made one. These fractional sizes have nothing to do with the actual dimensions of an instrument; in other words, a 3/4-sized instrument is not three-quarters the length of a full size instrument. The body length (not including the neck) of a "full-size" or 4/4 violin is about 14 inches (35 cm), smaller in some 17th century models. A 3/4 violin is about 13 inches (33 cm), and a 1/2 size is approximately 12 inches (30 cm). With the violin's closest family member, the viola, size is specified as body length in inches or centimeters rather than fractional sizes. A "full-size" viola averages 16 inches (40 cm). To tune a violin, the A string is first tuned to a standard pitch (usually 440 Hz), using either a tuning device or another instrument. (When accompanying a fixed-pitch instrument such as a piano or accordion, the violin tunes to it.) The other strings are then tuned against each other in intervals of perfect fifths by bowing them in pairs. A minutely higher tuning is sometimes employed for solo playing to give the instrument a brighter sound; conversely, Baroque music is sometimes played using lower tunings to make the violin's sound more gentle. After tuning, the instrument's bridge may be examined to ensure that it is standing straight and centered between the inner nicks of the f-holes; a crooked bridge may significantly affect the sound of an otherwise well-made violin. The tuning G-D-A-E is used for most violin music. Other tunings are occasionally employed; the G string, for example, can be tuned up to A. The use of nonstandard tunings in classical music is known as scordatura; in some folk styles, it is called "cross-tuning." One famous example of scordatura in classical music is Saint-Saëns' Danse Macabre, where the solo violin's E string is tuned down to E flat to impart an eerie dissonance to the composition. Another example would be in the third movement of Contrasts, by Béla Bartók, where the E string is tuned down to E flat and the G tuned to a G sharp. The violin bow; At the frog end, a screw adjuster tightens or loosens the hair. Just forward of the frog, a leather thumb cushion and winding protect the stick and provide grip for the player's hand. The winding may be wire, silk, or whalebone (now imitated by alternating strips of yellow and black plastic.) Some student bows (particularly the ones made of solid fiberglass) substitute a plastic sleeve for grip and winding. Attaching a small metal, rubber, or wooden device called a "mute" to the bridge of the violin gives a softer, more mellow tone, with fewer audible overtones; the sound of an entire orchestral string section playing with mutes has a hushed quality. The conventional Italian markings for mute usage are con sord., or con sordino, "with mute," or senza sord. (or simply senza), "without mute." Larger metal, rubber, or wooden mutes are available, known as "practice mutes" or "hotel mutes". Such mutes are generally not used in performance, but are used to deaden the sound of the violin in practice areas such as hotel rooms. Some composers have used practice mutes for special effect, for example atthe end of Luciano Berio's Sequenza VIII for solo violin.